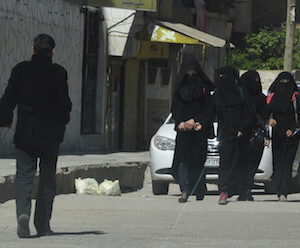 (Re-Published from the New America Foundation Weekly Wonk, Nov. 13, 2014) If you’re a woman living in Raqqa, Iraq, you already had enough to worry about: your government recently lost a quarter of the country to the Islamic State. Basic resources like food, water, and electricity are scarce. US air strikes in the region are on the rise. [pullquoteright]Abuse of sharia helps to empower hyper-Islamist conflict actors, like ISIS, and legitimate such groups’ exercise of power through violence.”[/pullquoteright]You can now add something else: adhering to strict Islamic dress codes. Beginning last month, the local government has tasked a new, all-female sharia police unit, the al Khansaa brigade, with cracking down on civilian women who do not abide by ultra-strict versions of sharia law imposed by the Islamic State. The new restrictions require women to be fully covered and to be chaperoned by a male in public. Now, if you’re not a woman living in Raqqa, why should you still worry about al Khansaa and the networks of conflict actors that have authorized these and similar groups? Because this abuse of sharia helps to empower hyper-Islamist conflict actors, like ISIS, and legitimate such groups’ exercise of power through violence. In other words, if we’re not careful, the Al Khansaa brigade could make an already deteriorating situation in the Middle East much worse. So what’s the purpose of this extremist sharia strategy for governments? Some states employ extraordinary versions of sharia to help consolidate regime power and solve political problems – to the dismay of ordinary, devout Muslims. In the past, governments have resorted to extreme shari’a to give cover to officials engaged in corruption and crime, distract from leaders who have immiserated the population or its minorities, or even those who propagate never-ending conflicts, many with an ethnic charge. This dynamic of political influence and violence in the support of extreme sharia has been treated in the obvious Gulf cases of Saudi wahhabism and Qatarian double dealing. Now, we’re seeing it at work in Syria and Iraq as ruling or competitor regimes deliberately or unwittingly support jihadists’ violence—and its sharia rational—in the service of political survival. Emily Schneider (LAW ’13) is a research associate for the International Security at New America and a graduate of INSCT; Alliya Anjum Razavi is a Research Associate at INSCT and a 2013 graduate of the Fletcher School of Law and Diplomacy at Tufts University; and Corri Zoli is Director of Research/Assistant Research Professor at INSCT.